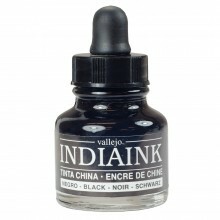 India Ink manufactured with permanent pigments and a shellac binder, formulated especially to facilitate the extension of the pen-stroke. A range of 10 intense, opaque and semi-opaque colours presented in glass pots with eyedropper. The colours can be mixed with one another and diluted with water. They dry quickly, lightfast and waterproof, with a velvety finish. Pens and brushes can be cleaned with water.